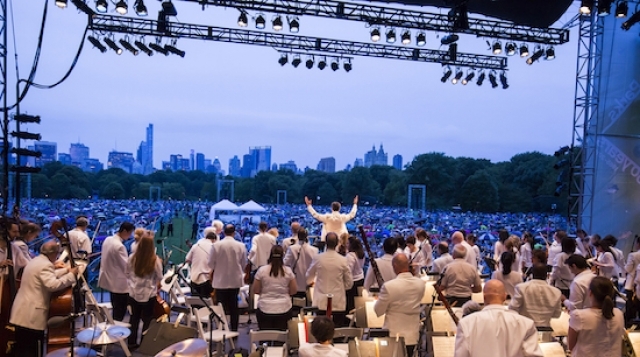 Alan Gilbert gave his final New York concerts as music director of the New York Philharmonic this week, leading the annual Concerts in the Parks series in four boroughs. Wednesday's concert on the Great Lawn of Central Park was blessed with magnificent weather: clear skies and 80 degrees. Perfect. This particular concert also marked the end of the "New World Initiative," a year-long educational missive from the Philharmonic built around the themes and ideas of Antonín Dvorak's Symphony No. 9. Written during the composer's two-year American residency, the symphony incorporates spiritual and Native American ideas in its themes, and its Largo movement spawned its own spiritual: "Goin' Home." Gilbert then led the symphony itself, a four-movement work that requires a certain flexibility of rhythm to capture the unique, Bohemian spirit that permeates its pages. A common misconception about this work is that it is an "American" piece, but the motivic phrases and themes remain rooted in the slightly off-the-beat dance meters of the composer's native country. The first movement was foursquare, and troubles with the levels of the amplified sound did not help matters. The Largo was...well...okay, with the English horn solo accompanied by a few lone voices out in the vast crowd. However, the big climactic recapitulation of the brass chords failed to elevate and overwhelm. In the last two movements, Gilbert and the orchestra got their groove back, with a fiery dance movement followed by a furious finale. However, as all the themes returned "home" in the last pages, the overall effect was underwhelming. The second half of the concert was a huge improvement. Gilbert led the orchestra through the Symphonic Dances from West Side Story, the Broadway adaptation of Romeo and Juliet that remains Leonard Bernstein's best known and most popular work. Indeed, the orchestra reveled in this music, sounding liberated and free with the big jazzy breakdowns, the finger-snaps of "Cool" and the wild percussion and propulsive rhythms of the "Mambo" and the climactic "Rumble."